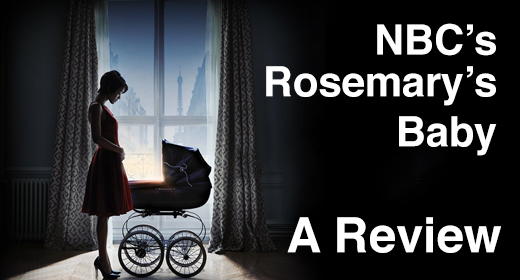 Don’t miss our review of NBC’s Rosemary’s Baby! I really wanted to love NBC’s Rosemary’s Baby. I had even made up my mind that I could like it if it was only slightly terrible, as long as they didn’t ruin or change too many of the things from the original movie that make it one of my all-time favorites. I have been excited about the miniseries since NBC announced that it was in development. I want network television to take risks and get back on par with cable. I’ve found hope in shows like Hannibal: the plotlines are good, the acting is superb, and the story is familiar yet still new to fans of the Thomas Harris novels. I thought that they could do the same thing with my beloved Rosemary’s Baby. However, this reboot fell flat. The miniseries could have easily been edited down to a two hour movie. There was way too much setup for characters that we only needed to know a little about, while the scenes with Margaux Castevet were totally wasted. There was so much more that they could have done with this character, but instead of any type of emotional or psychological development, I was forced to watch her chase Rosemary around with glasses of Satan juice and then try to kiss everyone on the lips. Even the change in setting from New York to Paris couldn’t perk up this slow-moving dud. The cast seemed promising, but even the best actors and actresses can only do so much with such a ho-hum script. While Mia Farrow’s Rosemary was not the epitome of modern feminism, Zoe Saldana’s version was exhausting as she wept her way through Paris. If she wasn’t already crying about something, then she was about to; also, Farrow’s Rosemary seemed more proactive about her situation and the mystery surrounding it. By the time Saldana’s Rosemary started figuring things out, all that was left was desperation. And more crying. Jason Isaacs as Roman Castevet was just short of brilliant and Patrick J. Adams gave the role of Guy Woodhouse a new vitality, but neither was enough to save the miniseries. I had realized well before the last fifteen minutes of NBC’s spectacle that I had gone into this television experience with unrealistic expectations, and that I loved Roman Polanski’s movie version way too much to ever enjoy a remake. But the last scenes were an unforgivable final blow for me. We never actually see Rosemary’s spawn in the Polanski version; we do, however, see the horror and love and confusion reflected in Mia Farrow’s delicate features as she gazes upon her child for the first time, and we’re left with our imaginations to do the rest. In the remake we get to see Rosemary’s baby, and the Antichrist has computer-enhanced blue eyes and they look ridiculous. At that point, though, I expected no better. What did you think about Rosemary’s Baby? Am I being too harsh, or do you also prefer the original to the reboot? Let us know in the comments below! Check out the Guardians Of The Galaxy 2nd Trailer!